During the week in between both weekends of Jazz Fest, things tend to not slow down that much, as many musicians stay down in the Big Easy to play shows and see the rest of their musical brethren. 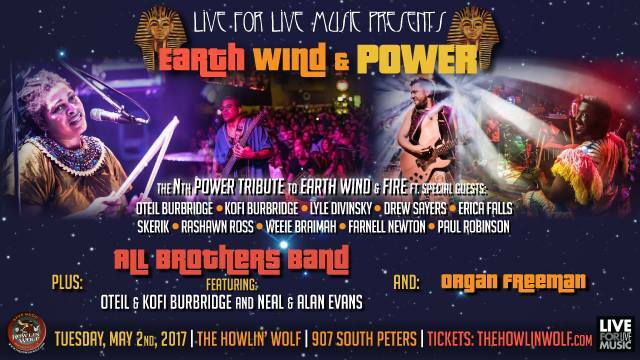 On Tuesday, May 2nd, The Nth Power will bring together a slew of special guests to re-create their Earth Wind & Fire tribute known as “Earth Wind & Power”. They’ll be joined by the second-ever performance of the All Brothers Band, made up of the dual-brother attack of Oteil Burbridge and Kofi Burbridge and Neal Evans and Alan Evans, as well as up-and-coming funk act Organ Freeman.